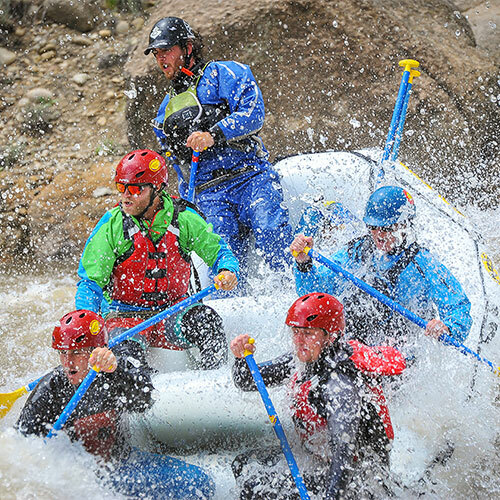 Located close to Vail, Colorado, the Arkansas River is the place to go for classic, family-friendly rafting as well as intense whitewater that athletic paddlers will love. Timberline Tours offers guided rafting trips on the Browns Canyon, The Numbers, and Pine Creek/The Numbers sections of the Arkansas River. Because this river is versatile and incredibly scenic throughout its entire length, The Ark—as we call it—offers exciting rafting for family reunions, weekend getaways, special celebrations, and even corporate and group events. But no excuse is needed to come rafting on the Arkansas River—it’s a destination in itself for summertime fun. An Arkansas River rafting trip begins when Timberline Tours picks you up at your Vail accommodation and brings you to the Timberline Tours boathouse in Granite, Colorado, where you will get outfitted with the essential rafting gear you’ll need for the trip, including personal floatation devices (PFDs), helmets, paddles, and wetsuits, when necessary. Arkansas River rafting trips also have a self-drive discount option if you’d like to drive yourself to the Granite boathouse. Once you’ve been outfitted for the trip, a Timberline Tours guide will lead an interactive discussion that highlights tips for paddling, common rafting paddling commands, and essential rafting safety advice. 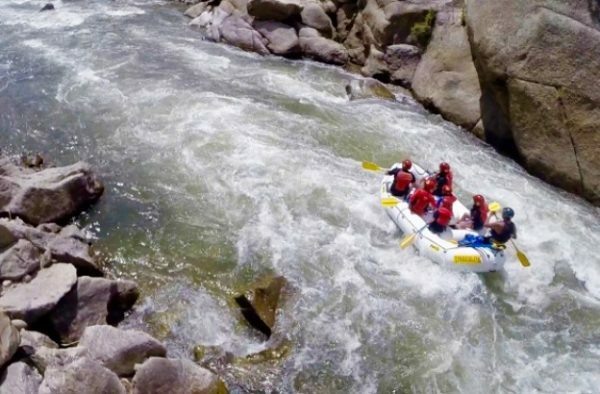 Timberline Tours will then take your group to the put-in location on the Arkansas River for the start of your rafting trip. You’ll push off…and then the adventure is underway. This family-friendly rafting trip will take you through the heart of Browns Canyon National Monument, an area known for its incredible mountain scenery and wildlife. While you’ll get the experience of paddling through some big and splashy rapids, you’ll also have some time to relax and enjoy mountain views and a riverside lunch. Age and weight minimums apply (see below). The Numbers is one of Colorado’s most thrilling sections of whitewater, with rapids so continuous that they’ve been numbered instead of named. The Numbers is an exciting, action-packed and fast-moving rafting trip, making it a good choice for athletic paddlers who want to dig in and paddle hard. A BBQ buffet lunch is served at Timberline’s boathouse in Granite following the trip. Age and weight minimums apply (see below). The Numbers Express runs the same stretch of river as The Numbers (above), but this rafting trip is an afternoon-only trip that doesn’t include lunch. Guests must drive themselves to the Timberline Tours boathouse in Granite, Colorado, where light refreshments and snacks are available following the trip. Age and weight minimums apply (see below). 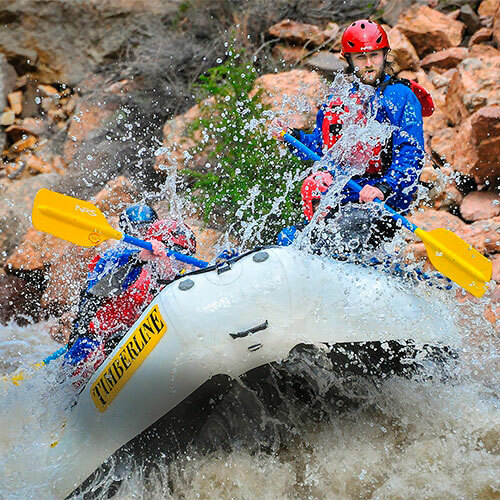 Pine Creek/The Numbers combines two of the most exciting and intense sections of whitewater rafting in the state of Colorado. Athletic adventurers who like to paddle hard will enjoy the thrill of this trip that goes through two Class IV stretches of whitewater in addition to the Class IV+/V- (expert, high intensity) Pine Creek Rapid in the Pine Creek section. Following the Pine Creek section, a variety of Class III and Class IV rapids keep the activity level ranging from moderate to intense throughout The Numbers section of the Arkansas River. A BBQ buffet lunch is served at Timberline’s boathouse in Granite following the trip. Age and weight minimums apply (see below). 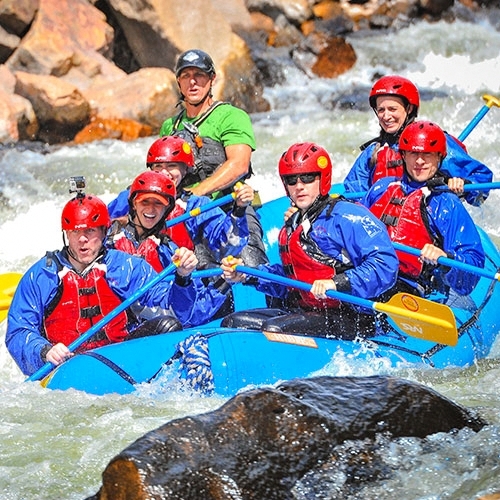 Timberline Tours runs rafting trips on the Arkansas River each summer from mid- to late-June through mid-August, and river dynamics change throughout this seasonal window. The Arkansas River is dam controlled, so in the early season, snowmelt combines with dam flow for higher water volume. Later in the season, the controlled dam flow keeps water levels consistent, which helps ensure the length of the rafting season. Timberline Tours closes its Granite boathouse mid-August when the dam significantly reduces its flow. The Arkansas River shrinks to a near-trickle for the fall and winter season, but it stays beautiful all year long. Browns Canyon: The minimum age for this trip is 8 years old and at least 50 pounds. The Numbers: The minimum age for this trip is 16 years old and at least 100 pounds. Pine Creek/The Numbers: The minimum age for this trip is 16 years old and at least 100 pounds. Note: These age and weight minimums can vary depending on water level. Please call our office to discuss requirements closer to your trip date. Please give us a call if you need help deciding what trip is best for your group: (970) 476-1414. And if you’re ready to book your trip, go directly to the Browns Canyon rafting trip page, where you can reserve Browns Canyon trips online. Since The Numbers and Pine Creek/The Numbers are Class IV and above, bookings must be made by calling the Timberline Tours office directly: (970) 476-1414. Finally, be sure to check out our “What to Wear Rafting” advice ahead of time to know what will increase your personal comfort and safety on the trip.